Covering an area of 71 percent of the Worlds surface, humans know proportionally little about the life in the oceans comparing to life on land. What we do know is that climate change and our carbon emissions are having major impacts resulting in rising sea levels, warmer temperatures and increased acidity. The oceans are a major carbon sink, absorbing between 30 and 50 percent of all anthropogenic CO2 emissions. The atmospheric carbon dioxide concentration is for the moment higher than experienced on earth for at least the past 650,000 years and studies predict that the CO2 in the ocean surface likely will double over its pre-industrial level by the middle of this century. As CO2 reacts with seawater it forms carbonic acid, causing a reduction in seawater pH, making it harder for ocean living species like corals to grow. Increasing water surface temperatures are also impacting Phytoplankton, scientists now warn of the major threat to the marine food chain. Reefs are the rainforests of the oceans and one of the most diverse ecosystems on earth. They are vital for the survival of many species and produce more living biomass than any other marine bio network. Three-quarters of the world's coral reefs are at risk of disappearing mainly because of exploitative fishing methods and climate change. Most threatened are the reefs in Southeast Asia. Coral bleaching is happening in many places, an indication of stress caused by environmental changes such as fluctuations in PH and surface temperature. 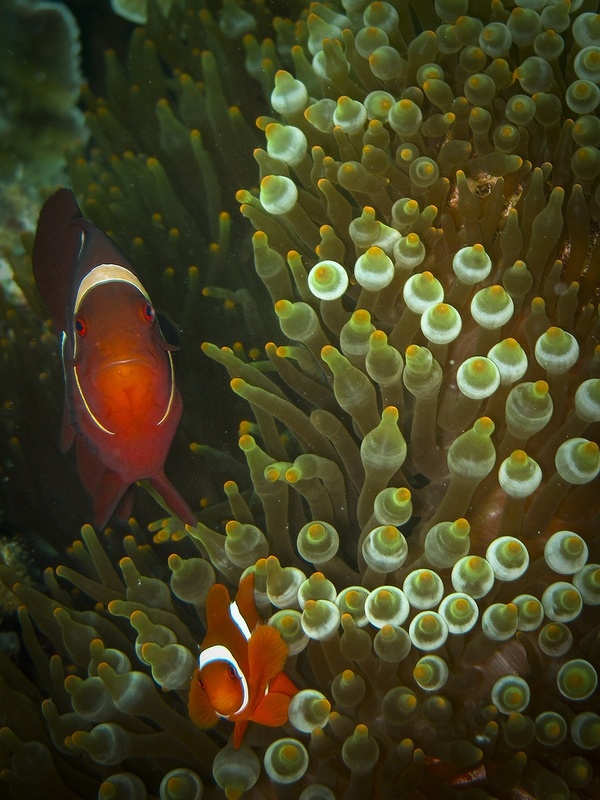 Bleaching occurs when the water is too warm and the symbiotic polyps living in symbiosis with the coral are expelled. In this state the corals are more sensitive, weaker and prone to disease. Unsustainable fishing methods have a huge impact on the life in the sea. Dynamite fishing, electro-fishing, fishing with poison and bottom trawling are still used in many countries.